Please select an option 5 6 7 8 9 10 11 Please select a ringsize. 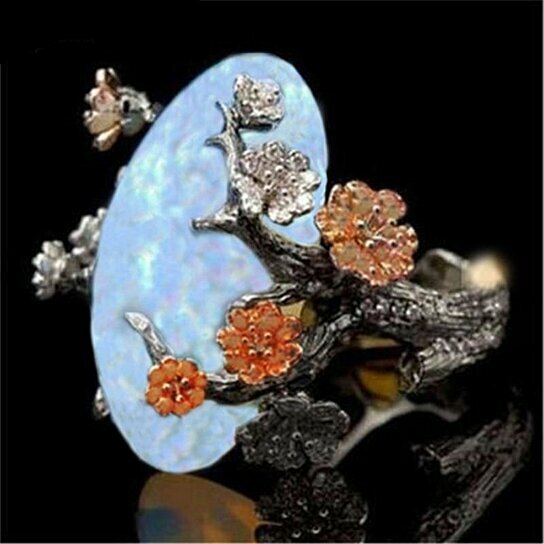 Ideal for relieving ailments of the stomach and digestive system, Opals also cures disorders of the hair, nails and skin. Be it a beauty or detox regimen that you’re trying to stick to opals can help in amplifying the effects as well as keeping you committed to the routines. Next most vital property opal use on the body is how it helps in retaining the water and beating the summer heat. Moreover, as opal keeps the wearer immune to infections, both viral and bacterial by boosting the functioning of your kidneys, liver and female reproductive system. In addition to waking the dormant mystical being within the wearer, Opals also boost the chance of making a stable communication with your spirit guide. Opal users are blessed with awareness about the universal consciousness and it raises your bodily vibrations. Wearers grow intuitive powers in addition to clairvoyance and powers of divination. In addition to the psychic powers, Opal boosts angelic energy into the aura of the wearer. Being a water stone, Opal introduces interspecies linguistic skills with aquatic creatures such as the whales and Dolphins excellently too. If you’re looking for a crystal to power up your lucid dreaming skills or communication with the subconscious, this is your stone! Calming energies form the centripetal force driving the crystal energy of every opal. It helps to ground the wearer by linking with the earth energy, boosting meditative vibes. Opals can help in resolving guilt and maintaining inner peace as well. Opal also resolves insecurities, fear, headstrong- attitude and stress in the wearer to ensure higher emotional freedom and flexibility.